In the spring and summer of 1942 Joseph Albert Audett (1920-2001), known as Bud or Buddy to his friends and family, was an air cadet learning to fly in the Army Air Forces in Merced, California. His mother Dorothy Guilfoil Audett (1897-1956), his father James D. Audett (1892-1977), and his kid sister Patsy (1925-1977) were in Chicago, then on the farm near Fennville, Michigan, his older sister Dorothy Audett Hanson (1917-2010) and her baby daughter Dee Dee were with her mother and then later in Memphis with her husband Eugene J. Hanson (1916-1997), and his great aunt Mary Stewart Leal (1890-1978) was in San Carlos, California with her husband Fernando Leal (1896-1997). Here are a selection of letters to Bud, courtesy of his son, Steve Audett. Reading our family's letters is nearly as good as hearing their voices. 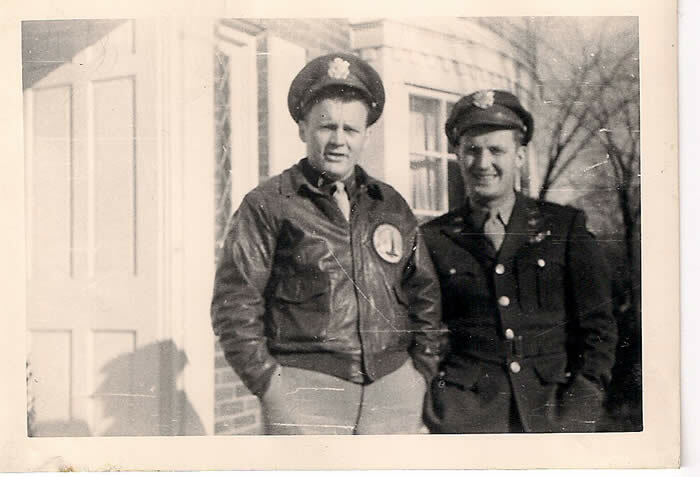 Bud's friend, Jimmy Friel, and Bud Audett.